When I first visited Sedona almost twenty years ago, it was much smaller and less congested. We always stayed at the Skyranch Lodge, located at the top of a high mesa overlooking downtown Sedona, right next to the small airport. I would get up early in the morning and walk halfway down the side of the mesa to the smaller hill which is reputed to be a vortex, and I would climb to the top of that hill and watch the sunrise. One evening we climbed the vortex hill and witnessed a Native American going through one of his sunset rituals–it was beautiful to watch. Back in those days, there were hardly ever crowds to contend with at sunset. But over the past twenty years, the word has gotten out, and now the airport mesa is “the place” to be at sunset. They’ve even built a special parking lot to hold all the cars that drive up to the top of the mesa. The edge of the overlook has now been roped off so you can no longer park there. People bring their lawn chairs, blankets, and every imaginable kind of camera, lens and tripod, and jostle for the best viewing angle. What used to be a quiet meditative area in the evening is now a major production….I guess you can’t stop progress, and I shouldn’t complain because I’m just one of the many tourists that contribute to the crowd. But sometimes it makes me wish I had never told a soul how beautiful Sedona is. As crazy as Arizona is right now, this is one of the things that makes living here worth putting up with the foolishness. It’s nice to know I can leave my house and be in a place like this in two-hours time. This entry was posted in Commentary, Information, Shooting and tagged airport, Arizona, AZ, camera, cloud, D700, HDR, Mesa, Nikon, Paint Shop Pro, photography, Photomatix, Sedona, sunset, Topaz, tripod, vortex. Bookmark the permalink. I like this image very much, especially the play of the cool cloud tones against the warm Earth tones, I have some similar images on that theme. I am saddened to see all of the rooftops though, it may be evidence of an expanding populace but it is not a mark of progress in my opinion. I agree, it’s sad to see so much development. 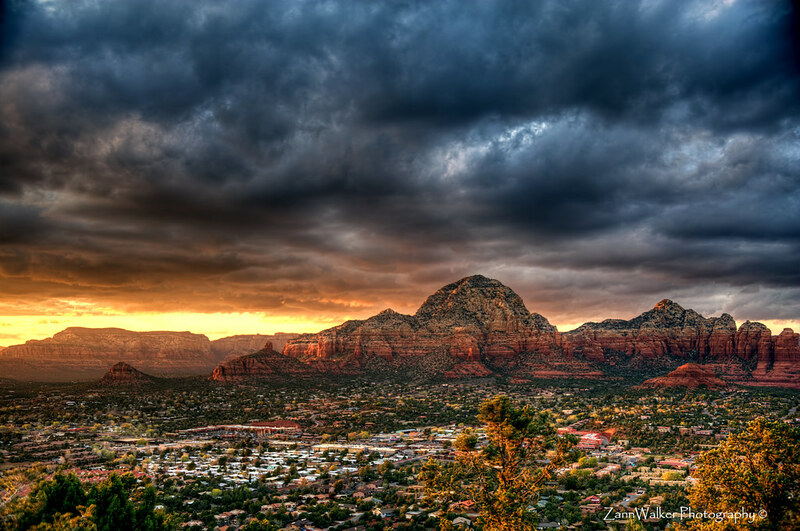 My husband is a native Phoenician, and he remembers when Sedona was just a crossroads. I first visited 20 years ago, and it has just exploded since then. I can understand why so many people want to live there, but once they move in, the reason they went there in the first place is destroyed. Catch-22.